What happens when a legend from Texas reunites with a legend from Dearborn? The most powerful Mustang ever. After 40 years, racing legend Carroll Shelby and the Ford Mustang are back together with the introduction of the 2007 Ford Shelby GT500. The collaboration between Shelby and Ford's Special Vehicle Team (SVT) is yielding an instant collector's Mustang that builds 500 horsepower in its 5.4-liter supercharged V-8. A modern interpretation of the Shelby Mustang of the 1960s, the Ford Shelby GT500 uses advanced engineering to attain the performance that made the original GT500 the king of the road. True to the original GT500, it will be available both as a coupe and as a convertible when it goes on sale in the summer of 2006. "When Carroll was developing the original GT350 and GT500, he wanted to build the most powerful, most capable Mustangs of his day," says Hau Thai-Tang, director, Advanced Product Creation and Special Vehicle Team. "Our goal was to build the most powerful, most capable Mustang ever." Serving as touchstone and inspirational leader for both the concept and the production versions, Shelby was impressed by what the team has accomplished. "It's one thing to put 450 horsepower in an exotic supercar," says Shelby. "It's another to put that much power in something as affordable as a Mustang. The fact that they not only met their goal but pushed on to 500 horsepower is a remarkable achievement." Shelby knows something about creating modern supercars. He served as a senior adviser on the team that developed and built the 550-horsepower Ford GT. As expected of anything with Shelby's name on it, the heart of the car is what's under the hood. The Ford Shelby GT500's supercharged 5.4-liter, 32-valve V-8 evolves from Ford's experience with tuning its modular, or MOD, engines. Output is a brawny 500 horsepower. The engine is force-fed an air-and-fuel mixture via a "Roots-type" supercharger providing 8.5 pounds per square inch of boost. 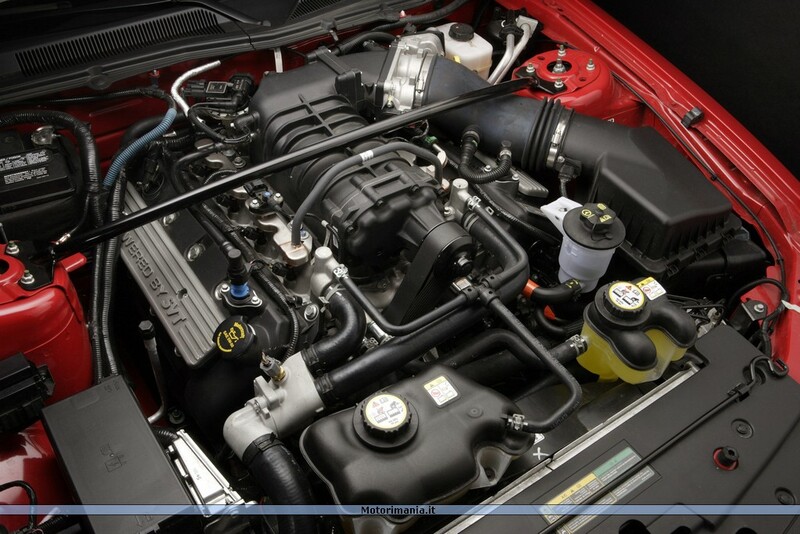 The GT500 uses a cast-iron engine block. It borrows from the Ford GT program aluminum, four-valve cylinder heads, piston rings and bearings, adding a high level of performance durability to the drivetrain. "Powered by SVT" camshaft covers add the finishing touch to the engine. Helping put the power to the pavement is a 6-speed manual gearbox. For the performance driver, its evenly spaced gears mean less "stirring" is needed to find the "sweet spot." This gives a rewarding experience throughout the engine's broad torque curve. The heavy-duty transmission has proven itself a willing companion to Mustangs in both road and track environments, including recent road-going Mustang Cobras and the new race-winning Mustang FR500C. The Ford Shelby GT500 continues a legacy of all-around performance that made the original a world-class racer on tracks and road courses around the world. The Ford Shelby GT500 starts with the solid Mustang underpinnings. The all-new Mustang was designed from the beginning with performance derivatives in mind, providing an exceptionally rigid, well-engineered starting point for GT500 chassis engineers. SVT engineers retuned and upgraded key chassis components. Improvements such as revised shocks, spring rates and upgraded stabilizer bars help the Ford Shelby GT500 stop and turn with the same authority as it goes. The Ford Shelby GT500 features a MacPherson strut independent front suspension with Reverse L lower control arms, and a solid-axle, three-link rear suspension with coil springs and a Panhard rod for precise control of the rear axle. This rear suspension design has been validated on the track by Ford Racing. The Ford Racing Mustang FR500C was purpose-built from the base 2005 Mustang body structure and suspension geometry to run in the Grand-Am Cup series, a class of road racing for production-based cars. Competing against the best from Germany and Japan, a Mustang FR500C won its first race in the season opener at Daytona International Speedway in February 2005. It went on to dominate the season and clinch the championship. "SVT and Ford Racing will be working closer than ever as we go forward on future projects, especially Mustangs," says Thai-Tang, a Ford Racing alumnus who served as the race engineer for the Newman-Haas Racing team in 1993. To match this power and handling ability, engineers fitted some of the biggest brakes in the business to the Ford Shelby GT500. Four-piston Brembo calipers are fitted to 14-inch Brembo vented rotors up front, and 11.8-inch vented discs in the rear continue SVT's legacy of great-braking Mustangs. Secure footing is provided by 255/45ZR high-performance tires in front and 285/40ZR high-performance tires in back. Wheels are 18 inches by 9.5 inches. One glance shows this is not the typical Mustang Cobra. A sinister-looking front-end design includes wide upper and lower fascia openings with a functional air splitter. The upper intake sports the famous Cobra logo floating off-center in place of a centered galloping pony found on other Mustangs. On either side, slanting headlamp openings add to the dramatic front appearance. The bulging hood has heat extractors protruding near the leading edge, combining to provide improved airflow and aerodynamics. As air passes over the hood, hot air from the engine compartment is drawn out through ducts attached to the hood extractors. "The restrained, performance-oriented SVT design theme has become instantly recognizable to enthusiasts without brash styling cues," says Doug Gaffka, design director, Ford SVT vehicles. "The GT500 takes a huge leap forward by combining the modern Mustang muscle car with the classic Shelby performance look." The 2005 Mustang design team drew inspiration from classic 1968 Mustangs, the models that transformed the mild-mannered pony car into a muscle car with attitude. Envisioning a high-performance model, the team tested GT500 design cues on the Mustang GT coupe concept that was unveiled at the 2003 North American International Auto Show. 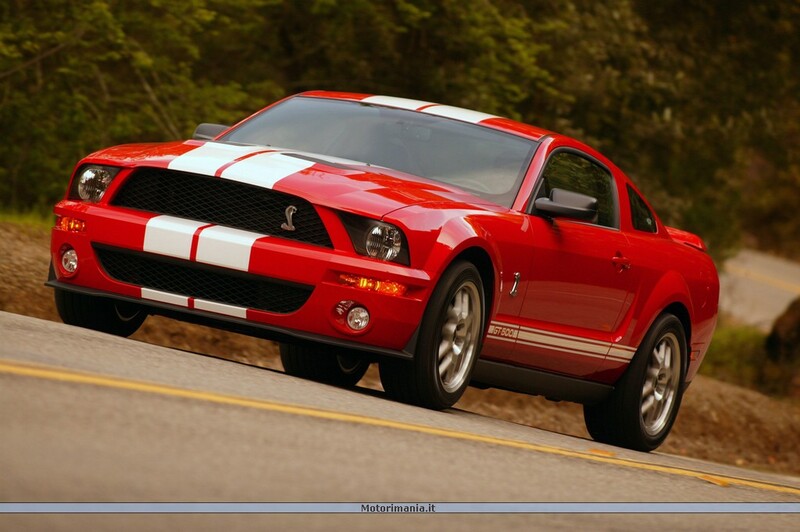 In 2004, designers further developed the GT500 look on the Mustang GT-R, a race-bred concept with the dual purpose of foreshadowing SVT's Mustang design direction and Ford Racing's plans to return Mustang to road racing. The Ford Shelby GT500 Cobra concept coupe capped the design conceptualization effort. The production Ford Shelby GT500 Coupe now comes into full light, punctuated by the classic Le Mans-style white stripes that race along the top from nose to tail. The stripes recall the Shelby Mustangs that marked another important 1960s Mustang transition when Ford put it on the track to becoming a racing legend. 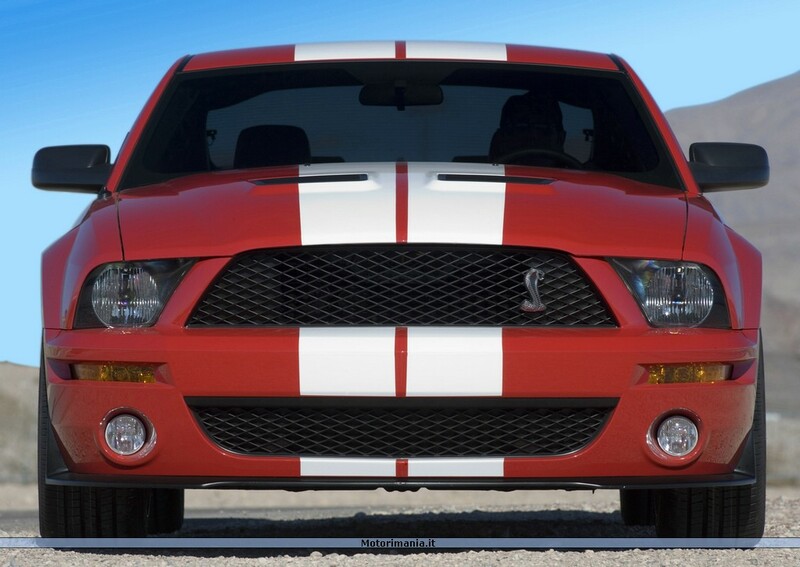 The GT500 nomenclature is prominent in the lower bodyside racing stripe, another cue from the classic Shelby Mustangs. In a touch also borrowed from the GT500's past, no Le Mans stripes will be seen on the 2007 Ford Shelby GT500 Convertible. However, the convertible will sport a cloth top similar to those found on pricier convertibles. "There were no Le Mans stripes on Shelby's original GT500 Convertible, so we decided to pay homage by not offering them on the 2007 Ford Shelby GT500," says Gaffka. "We also went with a cloth top material as another measure of substance and authenticity. The fabric used is the same used on the 2002-03 SVT Mustang Cobra, the Thunderbird, Jaguar and Ford's other high-end convertibles." The unique rear fascia features lower strakes inspired by the Ford GT's integrated rear airflow diffuser, and a rear spoiler reminiscent of a classic GT500. To mark the collaboration of two Mustang performance icons, the GT500 features Shelby and SVT badging. The fenders each feature an updated design of the Cobra. The front grille features an off-center snake in place of the standard running horse. 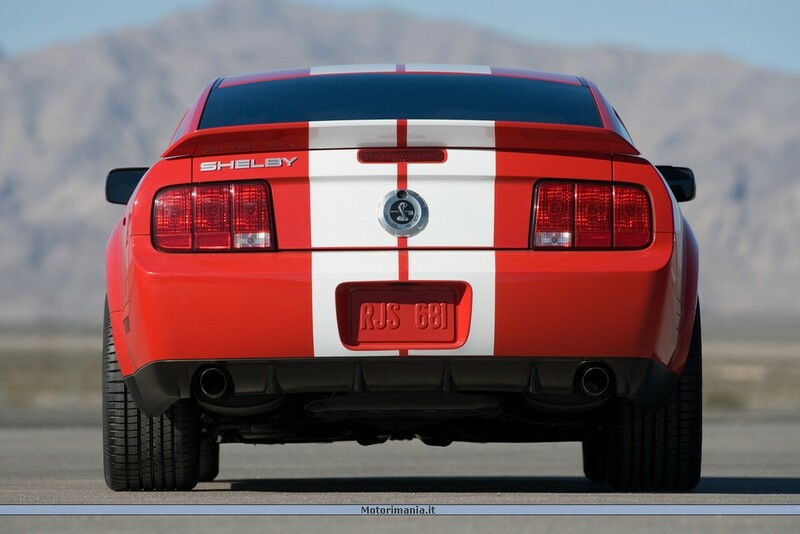 "GT500" is emblazoned inside the side rocker stripes, and the name SHELBY is prominently written across the rear deck. The SVT logo can be seen on the wheel center caps, a signature SVT location, as well as on the doorsill plates. 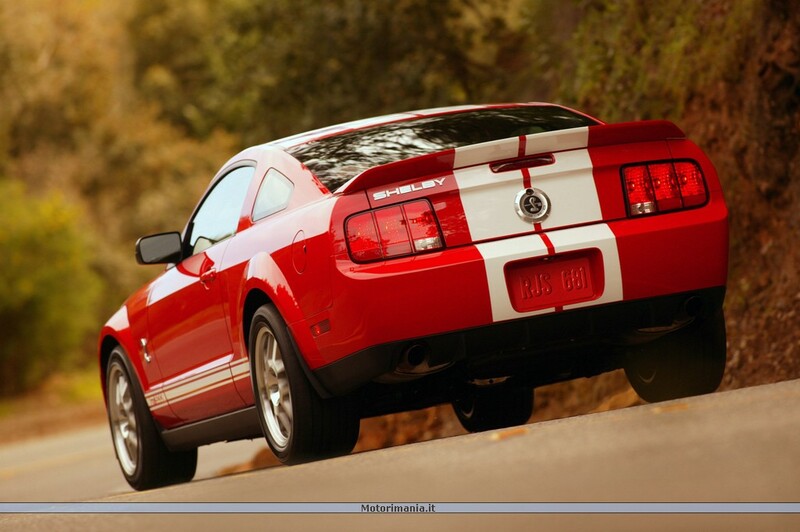 To top it off, the medallion between the taillights reads "Shelby GT500" centered on the Cobra image. Inside, too, upgraded levels of flair and function abound. The locations of the speedometer and the tachometer are swapped to provide performance-oriented drivers with a better view of shift points while changing gears. Front seats have received additional lateral support to help keep the driver optimally positioned during cornering. The interior is offered in a choice of two colors, Charcoal Black or Charcoal Black and Crimson Red. The charcoal/red offering features Crimson Red seating surfaces and door panel inserts. Seating surfaces are leather with both interior treatments. Snake logos embossed in the seat backs finish the package. The Shelby GT500 script and Cobra image are repeated on the steering wheel cap. Behind the wheel, the gauges wear light faces in keeping with SVT tradition. The chromed accessories inside the cabin have been replaced with a satin aluminum finish, including the aluminum shift lever knob that is nicely positioned for quick, positive shifts. With the look and legend one would expect from Shelby and the kind of power and performance enthusiasts have come to expect from SVT, the GT500 points to a brand-new era in Ford's performance future. Shelby first put his name on a Mustang back in 1964 when he was asked to inject some high performance into the brand-new pony car. The result was the GT-350R, a lightweight, handling-focused race car that earned Mustang its first performance credentials. Subsequent Shelby Mustangs included a street version of the race car, the GT-350, and what was known as the "rent-a-racer" Mustang, the GT-350H, a joint project with the Hertz rental car corporation. The ultimate Shelby Mustang of the era was the GT-500KR, or "King of the Road." Powered by a big block 428-cubic-inch "Cobra Jet" V-8, the GT-500 was one of the most powerful, and memorable, muscle cars of that period. Shelby Mustang production ceased in 1970 with a total volume of 14,559 units. The Ford Special Vehicle Team brought high performance back to Mustang in 1993. After 12 years, with nearly 80,000 high-performance Mustangs on the streets and total SVT vehicle production nearing 145,000, SVT is primed for growth with the GT500 serving as the foundation for other performance Mustang projects. By bringing together Shelby and Ford SVT, the company's commitment to performance becomes as powerful as at any time in its history - including the famed "Total Performance" days of the 1960s. From the Ford GT supercar, the GT500, to a rejuvenated Ford Racing Performance Parts program, performance and racing can drive innovation and add luster to Ford's proud brand heritage. "SVT will remain the leader in performance vehicle engineering," says Thai-Tang. "It will continue to build new, innovative products using advanced processes that will not only provide great enjoyment to the dedicated driving enthusiast, but that also will provide great benefit to other Ford products and Ford Motor Company itself." The Ford Shelby GT500 will be built at the Ford-Mazda joint venture, AutoAlliance International, in Flat Rock, Mich.